Skeptical about chiropractic care? Surprisingly enough, Dr. Boyd was at first. "An appointment was made for me to see a local chiropractor for neck pain I was experiencing daily after a high school football injury. I was reluctant but went to humor my parents." "It was incredible," continues Dr. Boyd. "I'll never forget that first adjustment. It was as if a huge weight was suddenly lifted from my shoulders. That's when I decided I wanted to be a chiropractor." Dr. Boyd began his pre-chiropractic education at the University of Illinois where he studied the basic sciences such as organic chemistry, inorganic chemistry, and biology along with advanced physiology and anatomy courses. He received his bachelor's degree in Kinesiology in 1992. After completing his studies there, he was accepted at Palmer College of Chiropractic in Davenport, Iowa. During his four years at Palmer, courses included biochemistry, a major emphasis on anatomy and human physiology, x-ray, diagnostics, chiropractic adjusting techniques and patient care in the Palmer College Public Clinics. After graduating in 1996, Dr. Boyd practiced in his hometown of Peoria, IL for two years. In 1998 he moved to the Centennial area to establish his practice. Dr. Boyd's love of children motivated him to learn how to help families even more. 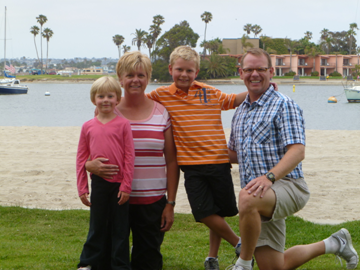 Therefore, in addition he has received a Fellowship in Pediatric Chiropractic Care. Many of Dr. Boyd's patients are infants and children with health complaints ranging from colic to scoliosis. Dr. Boyd said, "I am privileged to be a chiropractor. Everyday I see miracles as people with long term health complaints get better. All this can occur without taking drugs or the risk of surgery." Dr. Boyd married Susan, a Colorado native, in 1999. She is a schoolteacher and they are blessed to have two beautiful children, Tyler and Ella. Colorado is a wonderful place to raise a family and they enjoy exploring the abundant outdoor activities it has to offer, such as camping, hiking, skiing, and bicycling as well as spending time with friends and family. Help patients obtain and maintain optimum health. Not only finding, but correcting the cause of each patient's health issue; Dr. Boyd is able to keep his patients healthy so the condition does not return. The mission to keep Centennial healthy is one Dr. Boyd takes personally. "Thank you for visiting our site. We look forward to being a source of hope and healing for you and your family. If you have any questions, please give our office a call or click on the Email the Doctor button at the bottom of the page."